A blind man insists on crying out to Jesus, getting on everyone’s nerves. How was his vision better than theirs? As Jesus, His disciples, and “a sizeable crowd” were leaving Jericho (a city about 17 miles northeast of Jerusalem), they encountered a blind beggar, Bartimaeus, sitting by the roadside. The buzz from the crowd told Bartimaeus that Jesus of Nazareth was passing by. He began to cry out, “Jesus, Son of David, have pity on me.” This was a very unusual way for a person who didn’t know Jesus to address Him. It was full of Messianic significance. The Jews believed that the Messiah for whom they waited would be a descendant of King David and his rightful heir (see Isa 9:7; Ezek 34:23-24). In addition, Jewish tradition expected the Messiah to heal and exorcise demons, as it was believed that King Solomon once did (see Wis 7:20). So, in one loud cry, the blind beggar identifies Jesus as the One for whom all Jews longed. The crowd wasn’t amused: “And many rebuked him, telling him to be silent.” This raises two questions: (1) How did Bartimaeus know who Jesus was? (2) Why was the crowd so impatient with him? Because he was blind, Bartimaeus had to rely on what he was hearing from others about this Jesus of Nazareth. Had he heard stories from people who had seen Him? There was plenty of talk about the miracle-worker from Galilee. Notice that even here there was a “sizeable crowd” with Him. People who are blind rely on their other senses to learn what they need to know. 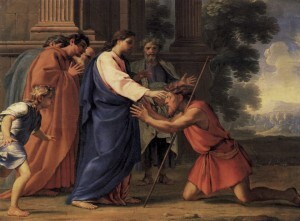 Bartimaeus was a beggar, unable to work to support himself because of his blindness. His hearing must have been acute, and he had lots of time on his hands. As he listened to what people were saying about Jesus, did he become convinced that the Messianic prophecies he had known all his life were being fulfilled in this remarkable rabbi? Even without being able to see Jesus, was he confident that he should make the most of this moment and cry out for pity from the Son of David, the new King of Israel? Why did “many” in the crowd try to silence him? Did they think that calling Jesus “Son of David” was wildly over the top? Were they convinced that a marginalized beggar like Bartimaeus should not accost someone as important as Jesus? Were their sensibilities offended on both counts? If so, then Bartimaeus could “see” Jesus much better than they. Their rebuke, coming from their blindness, made Bartimaeus all the more determined. No matter how hopeless and unlikely it seemed, he was not about the let this moment slip away from him. 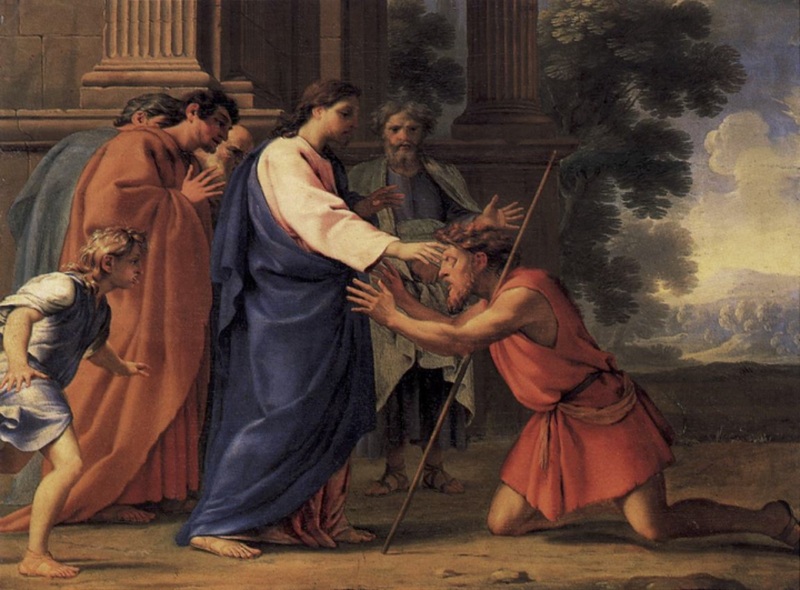 His perseverance paid off: “Jesus stopped and said, ‘Call him.’” We are not surprised to see the blind man’s response: “He threw aside his cloak, sprang up, and came to Jesus.” He was so eager to take his need to Jesus! It would seem obvious what Bartimaeus needed from Jesus was for his vision to be healed. Why didn’t Jesus just reach out and do that? Why did He ask the man, “What do you want from Me?” Perhaps Jesus wanted this encounter with the needy Bartimaeus to be personal (we have so often seen this in St. Mark’s Gospel). Jesus wanted a conversation with the man who already knew and believed so much about Him. Notice the humility in Bartimaeus’ response: “Master, I want to see.” He didn’t demand to be healed. He simply stated his deepest need to the One he believed could satisfy it. Physical sight is a blessing, but the opened eyes of the soul, as Bartimaeus teaches us, is a much greater gift. Possible response: Lord Jesus, I know that all my needs can lead me to You, if only I let them. Please help me hear when You call me to come. No wonder he wouldn’t shut up! Possible response: Heavenly Father, the world today is full of people living like exiles from You. Help Your Church announce the Good News of reconciliation in Jesus to them. This reminds us, again, of Bartimaeus. As Jesus passed by, he cried out for pity. However, he didn’t take a step towards Him until Jesus said, “Call him.” Once the call went out, the blind man had a ready, joyous response. When Jesus asked what he wanted, he made no demands; he simply stated his desire: “Master, I want to see.” In this, he becomes for us an example of humility. In humility, Jesus received His call to be our High Priest. In humility, He offers Himself to us in the Eucharist. As we stand before Him, in answer to His call, we can say with Bartimaeus, “Master, I want to see.” Jesus never grows weary of healing our blindness.